senior U.N. official said on Thursday. reporters. “You would be shocked to learn that maybe it is up to 3,000 AMISOM [African Union Mission in Somalia] soldiers that have been killed during these years that AMISOM has been there,” he said. The 17,700-strong African Union force began deploying to Somalia in 2007. It includes troops from Burundi, Uganda, Kenya, Sierra Leone and Djibouti. Kenyan troops are, of course, also a large part of AMISOM.” By way of comparison, 3,096 U.N. peacekeepers have died since 1948, according to the website of the U.N. Department of Peacekeeping Operations. and institutions are in tatters. A newly appointed parliament last year elected a new president, the first vote of its kind since the toppling of former military dictator Mohamed Siad Barre in 1991. Mogadishu and other urban centers in the past two years, but the group is still able to launch major attacks, including a suicide bombing on Sunday that killed at least eight people. Eliasson said on the sidelines of a donor conference in London earlier this week that sought pledges to rebuild Somalia that the United Nations has given strong backing to the country’s new leadership. This entry was posted in Uncategorized and tagged AL SHABAAB, AMISOM, SOMALIA. Bookmark the permalink. Wow!!! this is a fearsome toll for a relatively ‘low intensity conflict’ is this correct?? so the deputy defence minister of Kenya was right about casualties. he took a lot of flack from the Ugandans when he said they’ve lost over 2000 plus. the conflict had minimum media coverage, but it was severe and intense. 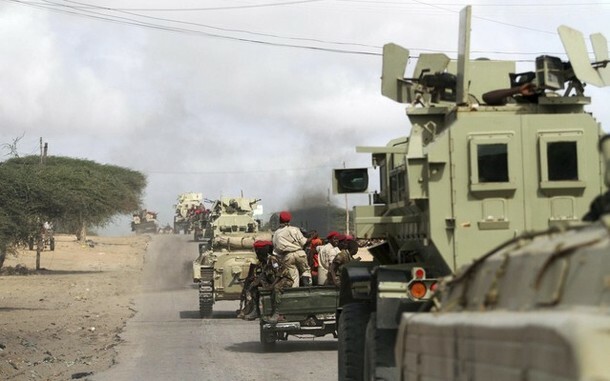 AU heavy casualties where at the early stage of the intervention. the Ugandans and Burundians soon learnt a thing or two about urban warfare and where able to slowly rollback al shabab. credit to them, Somalia is slowly rising from anarchy and the urban centers getting more govt presence. the east Africans where able to sort out Somalia without non-African boots on ground. one would have expected Nigeria to show leadership in similar capacity in Mali. kudos to the EAC. for low income countries like Uganda, casualty rate will not impede their mission status. in fact, they still manage to over deploy each and every single year lol. Yeah man , the difference is that we financed, underwrote and bungled our mission all by ourselves. We spent billions of our own money, but could never afford Russian or Chinese weapons/logistics helicopters, attack jets, Mraps and the like. Things that would have guaranteed us a quick victory. and way less casualties. Uganda and Burundi however sacrificed their blood, but their treasure was largely reimbursed by the US and the EU. The UPDF also benefitted from some of the best CTCOIN training provided by a Washington based PMC that was staffed by US and EU ex spec ops types. They also got other US largesse in the form of air conditioned living trailers, Kevlar helmets and vests, boots , MRAPs, Hesco barriers etc. etc. I believe the quality of the UPDF improved as a result. To top it off, Museveni has become a strategic big spender acquiring T-90 tanks and SU-30mk2’s. Where Uganda has gained from their sacrifice, Nigeria pretty much has nothing but experience to show for it. NA should have been massively reequipped, with the money we had to win those wars, and strategically keep Nigeria in the lead in African affairs. you said it all gen doziex, thumbs up. NA generals where stealing the money. in fact, the troops where far more impoverished, from rag tag combat fatigue to substandard weapons and helmet, add to the biased troops provisions and supply by western countries. to be fair, the likes of gen sani abacha, was all too comfortable keeping a large part of the army in LBR. these same military regimes where too paranoid to properly equip the armed forces; selfish small minded survival actions. the funny thing is that these regimes would still have been able to provide NAF with gunships and mil choppers, stationed semi permanently in LBR-SRL, without any threat to the seat of power in abuja. everything about ECOMOG missions in LBR and SRL where reactionary. they where never proactive. the few Field Commanders that took the mission more serious where all curtailed. the likes of dogonyaro, olurin, and malu wanted to seriously conclude the Liberian crisis.